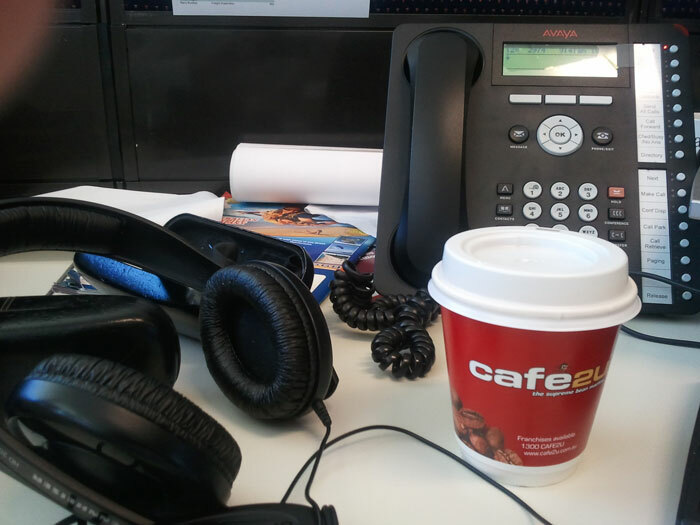 My day job involves online marketing and running on caffeine. 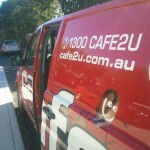 the rest is spent maintaining a few blogs on things I find interesting about the Internet, online marketing and coffee. 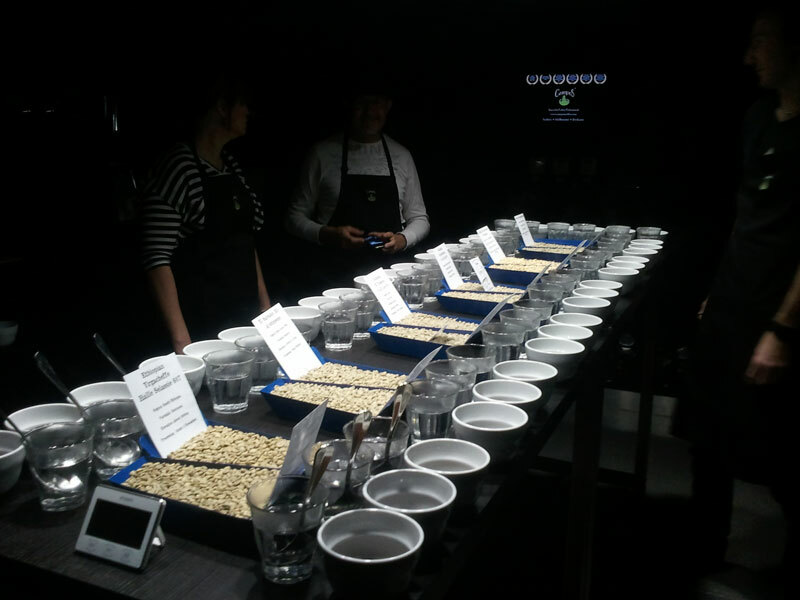 I only know of two dedicated cupping rooms in Australia, one in Sydney and another in Brisbane. And both are in Campos cafes. 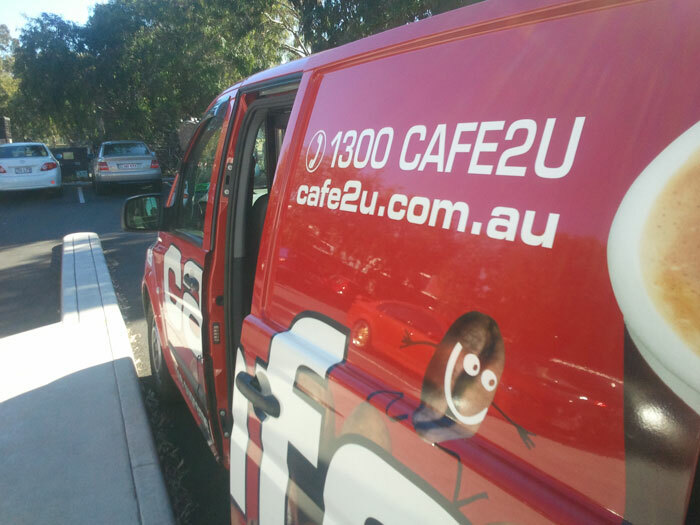 The one in Brisbane has been open for a few months now, and at least from what I’ve heard, has been popular. There isn’t much about it on their website, and I only found out because I saw the cupping room at the cafe, and some discussion on Twitter. 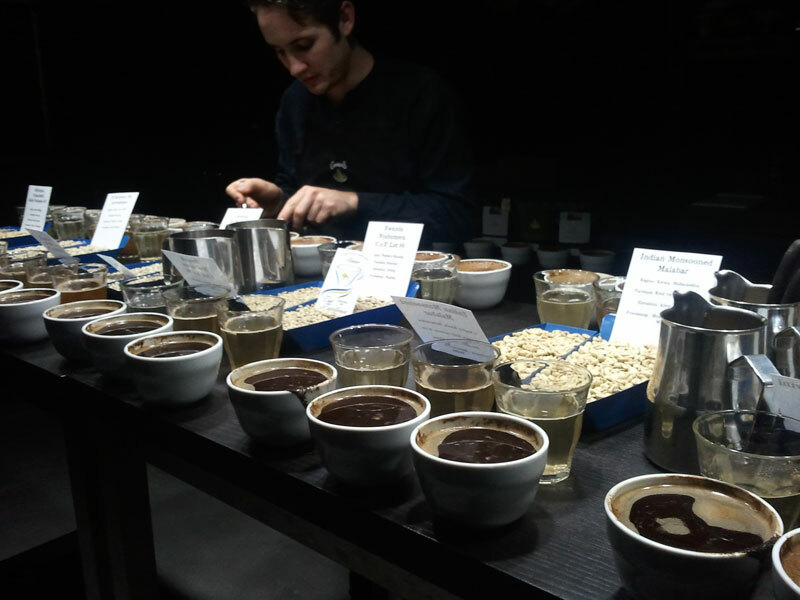 I had never been to a cupping session, and I had no idea of what ‘cupping’ even was. Dandelion and Driftwood sell cupping journals. When I first saw them, I had absolutely no idea what they were for. 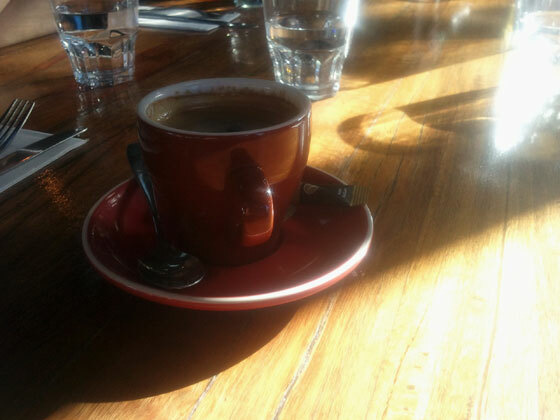 However, as this session was being held at one of my favourite cafes, which is also a local roaster, a group of friends and myself booked a Saturday session. 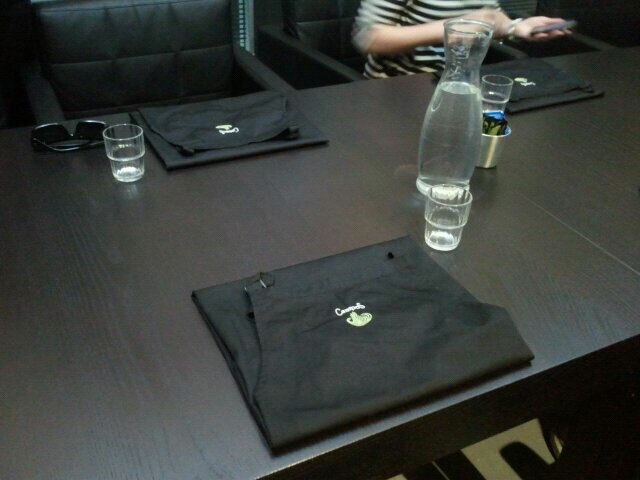 On the day, the five of us were shown to the meeting room out the back, where we were given aprons (apparently spills are not uncommon) before heading into Campos’ dedicated cupping room. It was very cool. The light fittings were made from coffee cups. The lights were low and the room seemed full of coffee paraphernalia, though no more so than the rest of the cafe. 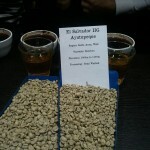 Cupping is a very specific coffee tasting technique, removing as many variables as possible to make it easier to compare different beans. 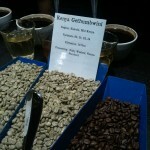 I learned that it makes it possible to compare coffee beans on their own merits. The tightly controlled preparation method means the tasters know they are experiencing exactly the same thing as the next taster, be they in the same room or in another country. It makes it a lot easier to talk about the coffee if you can remove all other variables. Campos had six different coffees for us to try: five single origin varieties from Kenya, India, El Salvador, Nicaragua and Ethiopia, and a commodity coffee for comparison. 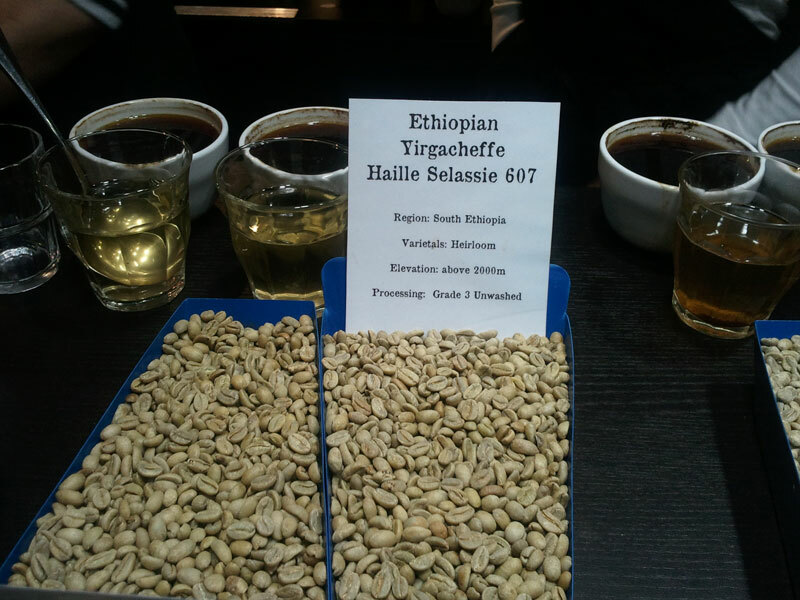 Each bean was served in a small bowl, with water heated to a specific temperature, left to brew, and then stirred, and then brewed some more, before the grounds were scraped off the top. It seemed to be a fairly involved process. 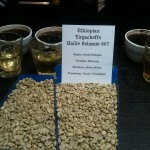 The whole time the coffee was being prepared, and during the tasting itself, everything about the beans was explained. They covered how each of the beans were processed, where they came from, who grew them, and a lot more. 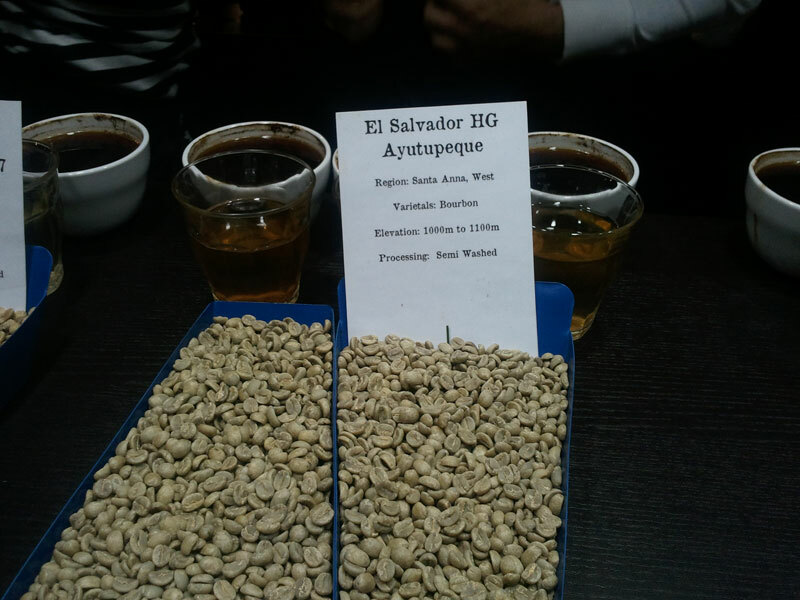 The highlight of the whole session was being able to compare so many different varieties of coffee. 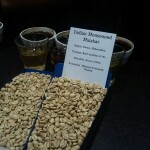 Each was distinctive and had its own qualities, with the Indian Malabar Monsooned beans being the most unique. 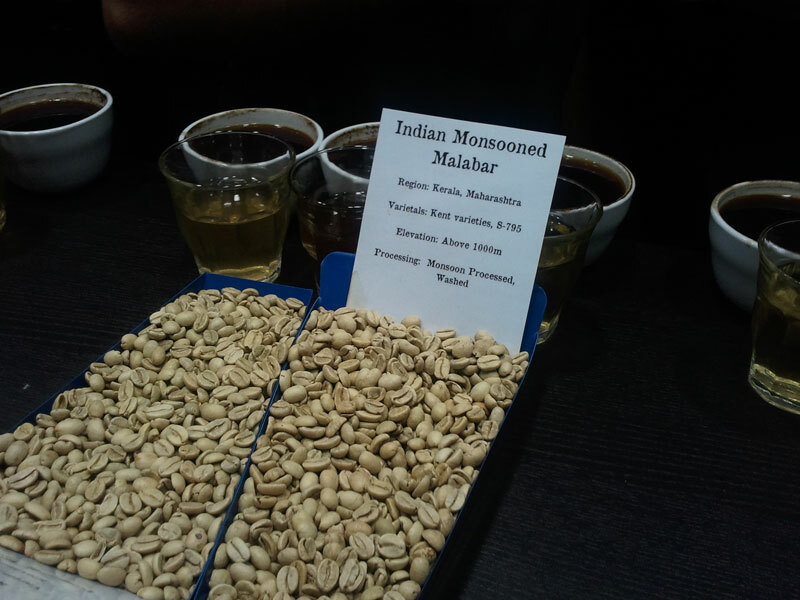 The only comparison more striking than the Malabar and the rest was between the single origins and the commodity coffee. 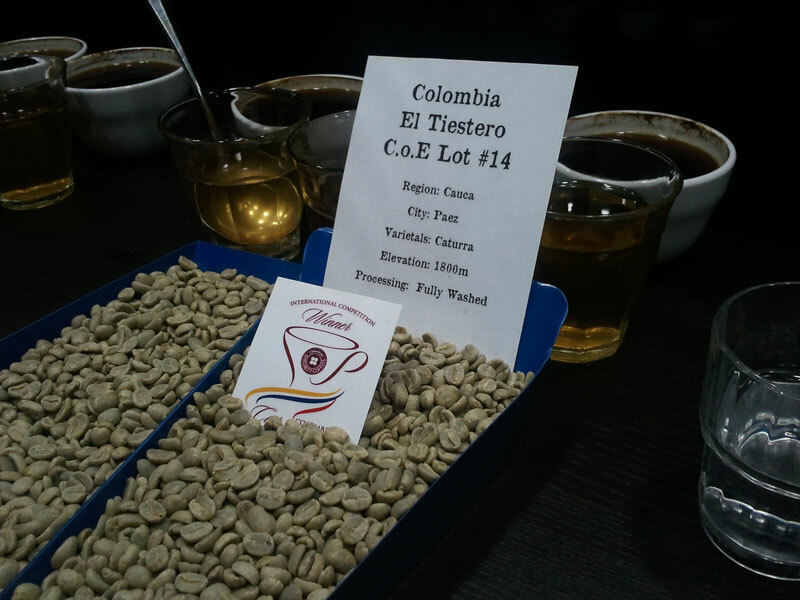 At just $11 it is cheap, and if you pay $20, you walk away with 250 grams of the coffee you liked best. 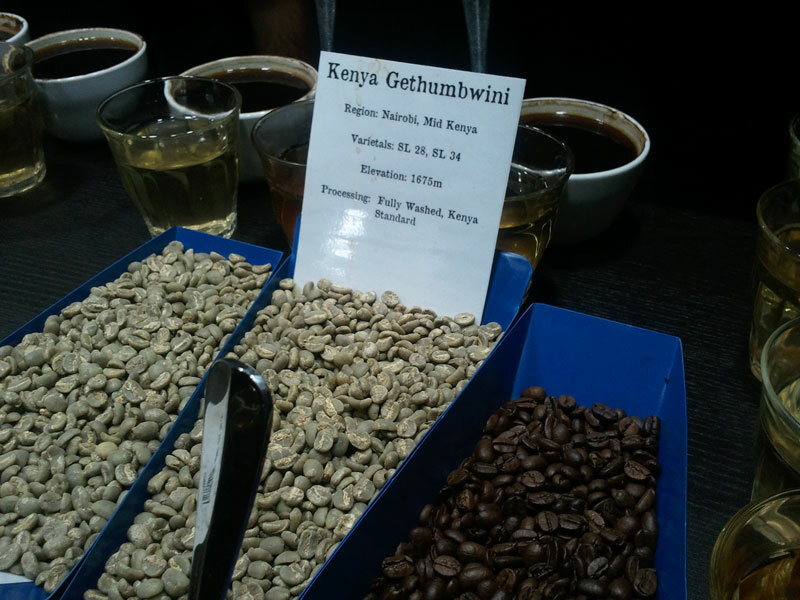 If you like coffee but did not even know what a cupping session was until you read this, then go and do one. 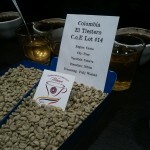 It is a great experience, and Campos has taken a commercial activity and turned it into a great customer experience. 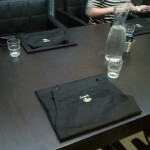 If you already knew what cupping was, you are probably already interested in booking a session. Previously you would have had to ask an Android user just how good Google+ can be on mobile, at least until the iOS version was released today. 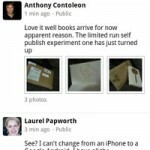 The mobile experience is, in my opinion, the most compelling reason that Google+ will build a userbase. As good as the the mobile site is, the app Google released for Android handsets and the iPhone is light years ahead of both the mobile site and its competition. 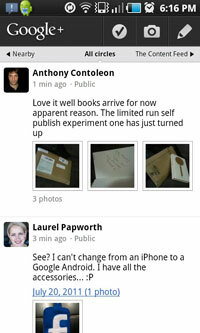 The Facebook app for Android does not look good next to the one for Google+, and is barely usable in most situations. Unlike the Facebook app, Google+ starts fast and is easy to navigate through. Both apps start on a screen of buttons, linking to the app’s functions, but Facebook also tries to display recent photos from your stream, which in some situations kills performance and gets in the way of doing whatever task I opened it for in the first place. I can’t say that Google+ has replaced Facebook for me on my phone, because I stopped using Facebook on mobile ages ago. It really was that bad. 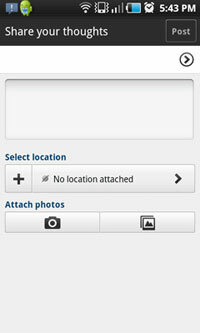 Basic activities such as posting updates, images and locations are integrated and painless, though there is no option to attach links, even using contextual sharing through the phone’s browser. 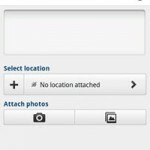 Selecting the Circles to share the post with is simple, and managing them through the app is easy. Circles are cool. They are a great way to manage who you talk to and separate people into discrete groups by relationship, interests, location and hair colour, and keep these groups up-to-date as circumstances change. However, no-one is ever actually going to do this as the time needed grows with the size of one’s social network, and those that try will go mad, or give up. I only ever seem to use just two of the Circles I’ve created: everyone I’m connected to on Google+, and everyone except those that post too much. It is the second Circle I spend all my time in, which is why it’s frustrating when Google+ defaults to the unfiltered stream, and even more so on mobile. Google+ supports lots of text, images, videos and comments, and the number of updates per pageview is low, especially on mobile. Consequently, noise management on Google+ is important, maybe even more so than on other platforms like Twitter. All Circles or your own? 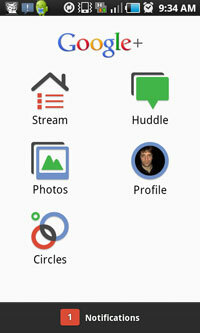 In the Google+ mobile app the stream has three default views: Nearby, All Circles and Incoming. Nearby is for public posts near where you are, Incoming is for people who are not in your Circles but who are following you, and All Circles is for all of your Circles. The app lets you swipe from one to other, which in itself is cool, and you can add additional Circles to these three as well. But it will always open on All Circles. This is very annoying, especially when my 3G decides the year is 1999 and it therefore doesn’t exist. Ideally Google+ also needs to allow its users to create Circles based on who isn’t being followed rather than who is. It would be even cooler if you could create Circles based on which Circles to exclude. A ‘Stream’ minus ‘Noisy People’ Circle would be cool, as would ‘People I’ve Met’ minus ‘Work People’. You could of course set up a Circle including everyone except the noisy people, and this would be a good idea too, assuming you are only connected to 20 people. Circles managed by inclusion really don’t look like they will scale well. And of course, Google+ still needs to let the user decide what they want their default stream to be. There is only one thing that might make it worth micro-managing Circles: Huddle. Google+’s group messaging feature is actually a good reason to go to the effort of creating and curating small Circles of people who occupy a very specific part of your life, just so you can message them as a group. From your phone. Easily. It is better than the Facebook app. By lots. 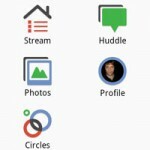 The app is stripped down compared to the desktop version, and does not include Hangouts or Sparks, but does include Huddle. Circles sound cool, until you try to manage them over time. Not being able to choose a particular Circle as your default stream is annoying. Jam Jar faces the street with a small foyer, with a counter and a reservation book. You walk through to the back to find a semi-outdoor setting with a collection of different kinds of tables and chairs set up under cover. The space looks like the back of a workers’ cottage, filled with too much furniture, but in a good way. The walls both inside and out the back are covered in art, and actually do make Jam Jar a really unique space. 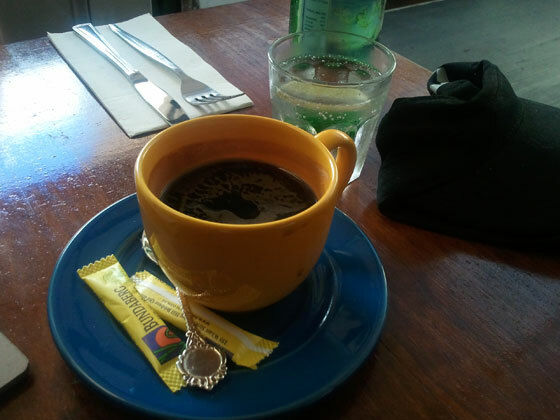 My coffee came out fast, and it was OK. On just the long black, Jam Jar would be unremarkable. But Jam Jar does more than coffee. They also do food. Very good, and very interesting food. Actually, go look at their menu right now, it’s worth it. 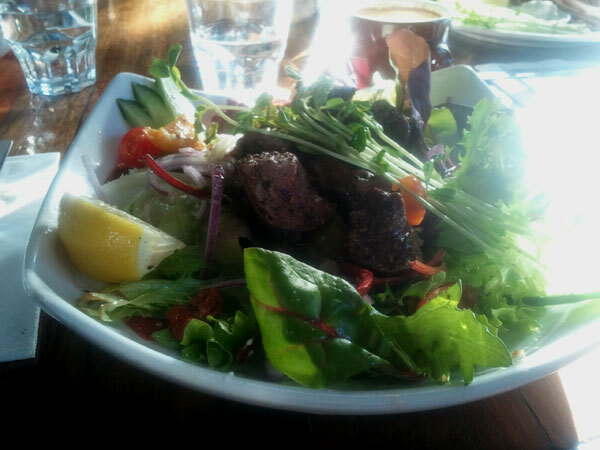 I followed the coffee up with a Mountain Goat Hightail, and along with the nibbles, it made for a great afternoon. Jam Jar is somewhere different, great for a long drawn out lunch, and seems to be more of a beer and food destination than just a cafe.